Acid secretion from parietal cells in the stomach is a highly regulated, complex, and dynamic process which is optimised to facilitate food digestion. It involves both the central and the enteric nervous systems (CNS and ENS respectively), in addition to a network of paracrine and endocrine cells. The overall aim is to maintain stomach luminal pH within a narrow range such that food digestion is optimised. Four cell populations and their secretory products form the core acid secretory process in humans. These four cell populations are gastrin (G)- and somatostatin (D)-secreting cells, endochromaffin-like (ECL) cells, and parietal cells. G and ECL cell products stimulate acid secretion (positive feedback) and D cells inhibit acid release (negative feedback). Exactly how these feedback loops interact is species specific, however, the basic requirement for acid secretion is conserved amongst species. Mathematical modelling provides a powerful tool for investigating the integrated system, and it is also immune to the inconsistencies of in vivo and in vitro experimental studies. In the Joseph et al. 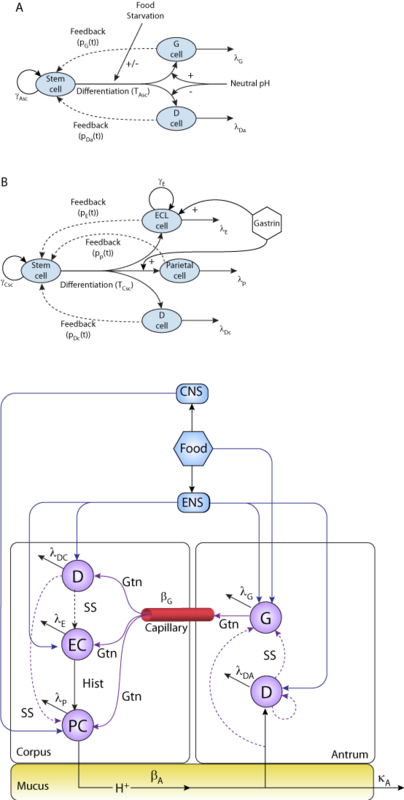 2003 publication described here, the authors use a novel mathematical model to describe the complex system of gastric acid regulation (see and below). They use experimental data to validate their model simulations, and then go onto use the model to study conditions that are not yet experimentally reproducible. Derived from workspace Joseph, Zavros, Merchant, Kirschner, 2003 at changeset 29d74e7429bf.